If you like to fish and you know what nanometers are, you probably already own this book. If you just like to fish and don’t know a nanometer from your grandmother, you’ll benefit from getting it. 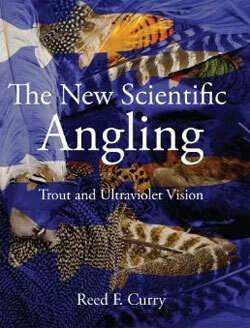 Before this book, the effects of UV light on trout vision didn’t get much attention in the angling press. But a browse through current fly and gear catalogs reveals a wealth of UV materials and patterns; it seems that there has been a surge of interest in all things UV. This book, published in 2009, was ahead of its time. The New Scientific Angling’s focus is on fly fishing for trout, but it seems plausible that its theories could also apply to gear fishers and/or to people who target, say, walleyes. This is potentially a book of wide application. Curry is an engaging writer, even on topics like the light spectrum and trout physiology. In less capable hands those topics would be serious yawners. His foundational premise is sound: trout don’t see our imitations the same way we see our imitations. We should to try to understand what they see so we can use the most effective flies for a given situation. From that starting point, Curry goes on to explain that trout are much more sensitive to UV than we are. He also notes that, despite some suggestions to the contrary, UV reflectance (which is what we’re interested in here) is not the same as fluorescence. This is a key concept, and it is one that anglers (and manufacturers) seem to ignore: as Curry notes, many firms describe their materials or lures as being “UV,” when in fact they fluoresce. In the simplest terms, UV is invisible to us; fluorescence (along with regular non-fluorescent colors) is not. (This is where the nanometers come in.) You won’t see a fly’s UV properties with the naked eye. This distinction raises all kinds of dilemmas. Another example: Curry notes that the white bellies of most baitfish reflect UV. Apparently fly tiers didn’t know this until recently, and even if they had known it they wouldn’t have had the materials to imitate those UV-reflecting underbellies. Since UV-reflectant synthetics have become readily available, we can tie more realistic baitfish imitations. And, as a final example, Curry suggests that the old “dark day, dark fly” concept has its roots in a fly’s UV characteristics. The problem is this: beyond a certain level there’s not a real strong correlation between visibility and attractiveness. A chartreuse lure in clear water might be highly visible, but it may also scare wary fish to yon riverbank. I wonder if reliance on UV-reflecting flies might ultimately present a similar problem. For example, yellow absorbs UV; white reflects it. Does that mean that white is always the better color? It doesn’t, and Curry makes no such claim. I’m not entirely sure how to use the information I’ve learned from the book, but it’s clear that Curry is not advocating a simple-minded UV/non-UV approach to fly selection. Curry does give us many concrete and useful strategies to use as starting points: eg, use more UV at dusk; if you’re fishing beetles, you don’t want UV in the fly. Beyond those and similar strategies, the book’s greatest virtue is that it creates an awareness that UV is a factor, and sometimes the deciding one, in fly selection. Of course, you can ignore all this and just go fishing, and this book is useful on that score too. It has a passel of humorous and/or instructive sidebars, many of which came from Curry’s website, www.overmywaders.com. It also offers a pretty compelling (and non-UV-related) theory for why trout often focus on the smaller of two insects during a complex hatch – and the explanation takes all of one paragraph. In addition, if you’re interested in all the critters lurking in the streamside brush and flying around in the trees, you’ll probably enjoy Curry’s discussion of why some of those animals have UV markings while others do not. It’s pretty fascinating even though it’s not directly related to catching fish. Intangibles like these are part of why we fly fish in the first place.